Over the last thirty years, the majority of Americans have started working longer hours while earning less, according to a recent report by the Center for American Progress. "Many feel, with some justification, that a 40-hour week would be career suicide. This schedule is seen as 'part time' in many professional-managerial jobs, and tends to spell a less-prestigious and less upwardly-mobile career path." Examining two government surveys conducted roughly 30 years apart, one using data from 1977 to 1979 and the other using data from the years 2006 to 2008, the report finds that people's approach to work-life and work-family balance has changed significantly. Supplanting the traditional 40-hour work week, many employees now work 50 hours or more. According to the report, male professionals especially work longer hours. 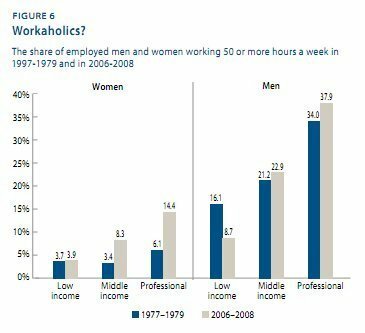 37.9 percent of men with professional and managerial positions worked over 50 hours a week between 2006 and 2008, compared to 34 percent from the years 1977 to 1979. With professional women, the change is even more striking: 14.4 percent work over 50 hours currently, while only 6.1 percent did 30 years ago. Indeed, pressure for women to work longer hours is greater than ever, especially for professionals like lawyers: "Part-time' [female] lawyers often take an immediate wage cut of 20 percent per hour for a 'part-time' schedule of 40 hours a week," writes the report. Only lower class men now work less hours than they have in the past, as the percentage of that demographic working over 50 hours per week has decreased by 7.4 percent over the same time period, indicating increased underemployment and difficulty finding full-time jobs, the report says. Despite this, incomes for the most part have not matched the extra hours worked. Since 1979, incomes have decreased 29 percent for the lower class and 13 percent for the middle. Upper class wages, however, have increased 7 percent over the same time period, which reflects the trend of longer hours resulting in disproportionately higher wages while wages for those working 40 hours a week have largely stayed the same.